John Erick Dowdle's horror flick is planned for Blu-ray in December. Pre-order your copy here. 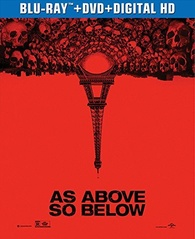 In an early announcement to retailers, Universal is set to release 'As Above So Below' on Blu-ray on December 2. Miles of twisting catacombs lie beneath the streets of Paris, the eternal home to countless souls. When a team of explorers ventures into the uncharted maze of bones, they uncover the dark secret that lies within this city of the dead. A journey into madness and terror, As Above So Below reaches deep into the human psyche to reveal the personal demons that come back to haunt us all. The Blu-ray will feature 1080p video, a lossless 5.1 soundtrack, and supplements will include Inside As Above So Below and an Ultraviolet Digital Copy. You can find the latest specs for 'As Above So Below' linked from our Blu-ray Release Schedule, where it is indexed under December 2.